Every year more than 300,000 hunting licenses are sold in Colorado to those in search of big game such as deer, elk, moose, pronghorn and even mountain lions. In a state of outdoor recreationalists, the billion-dollar industry is an economic driver that trails only behind skiing, with consumers spending approximately $21 billion dollars on trips and equipment in 2012 alone. With such high costs, there’s little room for experienced hunters such as Donnelle Johnson to lose focus on the goal. Not uncommon, but still scarce, she joins the ranks of more than 13.7 million hunters nationwide, 11 percent of which are women. Hunting for several years now, Donnelle is co-owner of HuntData, a company borne from the frustration of not knowing where to hunt and the time-consuming process of finding a successful hunting spot. Today, Donnelle leads hunting excursions and on occasion can be coaxed into sharing one of her many stories of how she has taken down a 6×6 bull elk with only a bow. Needless to say, Donnelle has gained the respect of peers who appreciate the skill and patience needed to take down a large bull elk from no further than 30 to 40 yards. Finding big game is also part of her expertise, and she’s always ready to share her experience. As part owner of a map publishing company and a hunter herself, Donnelle recognizes the importance of maps not only from a directional point of view but from a hunter’s perspective. Understanding where you are in relation to game herds is extremely important, especially when trying to delineate public lands from private property. With boundaries not often marked, trespassing and hunting on private land can rack up thousands of dollars in fines for the novice hunter. As a professional hunter, Donnelle is the first to attest that it can happen to the best of hunters. Avenza Systems, Inc., a leading developer of cartographic software, created a mobile app called PDF Maps for iOS and Android devices so that map publishers and individual cartographers could upload paper maps at no cost. Now in a digital format, maps could easily be downloaded onto a smartphone. Paired together with mobile devices that use GPS, the PDF Maps app provided the best of all worlds – the ability to read details clearly like a paper map, find your location with GPS and search for direction like a Google map, all without the need of cell service. 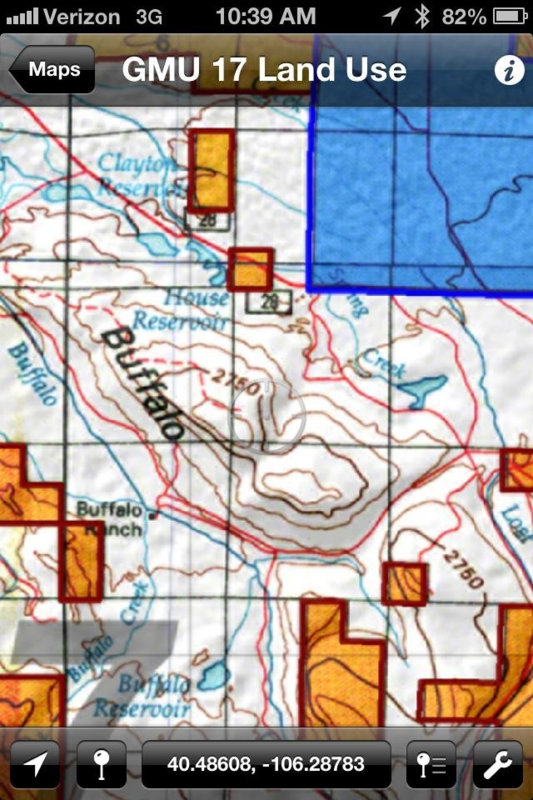 Although HuntData’s digital maps aren’t currently available for purchase in Avenza’s in-app map store, hunting maps for the Colorado, Wyoming and Arizona areas can be purchased from the HuntData site then downloaded to the Avenza PDF Maps app – this includes topo maps, elk concentrations maps and land ownership maps. As any active outdoorsman will corroborate, using a phone provides limited to no cell service on a hunt. 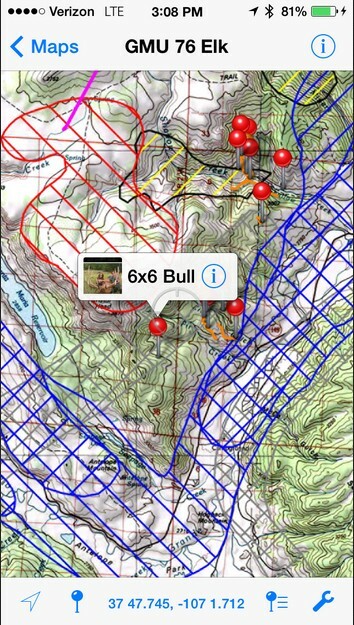 Maps on Google Earth are helpful, however they require a data connection in order to stream the maps, which can leave hunters in a predicament if they’re out of cell range. Avenza’s PDF Maps app stores the maps on the device and accesses the GPS capabilities on iOS devices and Androids, making it an indispensable tool when out in the field, and especially when there is no data. Furthermore, the maps usually found on Google or Apple Maps do not have accurate hunting and topographic detail, if any at all, whereas PDF Maps gives access to specialized maps for almost any outdoor/recreational purpose. Donnelle Johnson is a hunter, fisherwoman, CPA, photographer and a musician. She is co-founder of HuntData with her husband David. She is on the Mossy Oak and Bass Pro Shops Redhead ProStaff. She promotes women and youth in the outdoors through various speaking engagements. Avenza’s PDF Maps app is an all-inclusive solution for the transfer of conventional paper maps to digitized, interactive PDFs readily available for handheld mobile devices on the iOS and Android platform. It allows for consumers and businesses to utilize and purchase maps directly to and from their devices; any geo-referenced map may be uploaded and made available for purchase in a compressed, digital version which is both visually brilliant as well as convenient. For more information visit www.avenza.com or call (416) 487-5116.